On Tuesday night, during debate about the nomination of Jeff Sessions for attorney general, Republican extremists silenced Senator Elizabeth Warren as she was discussing Sessions’s record. They did not object to the facts she cited. They refused to hear them. This is what systemic racism looks like in America. As part of her remarks, Senator Warren read from Coretta Scott King’s 1986 letter to the Senate Judiciary Committee opposing the nomination of Sessions to a federal judgeship. The letter was never entered into the record by then–Judiciary Committee Chairman Strom Thurmond. Mrs. King’s words, however, were based on facts she had observed about Sessions’s beliefs and conduct. She knew, for example, that as US Attorney Sessions had tried to prosecute one of her late husband’s pallbearers for helping elderly citizens vote in Alabama. 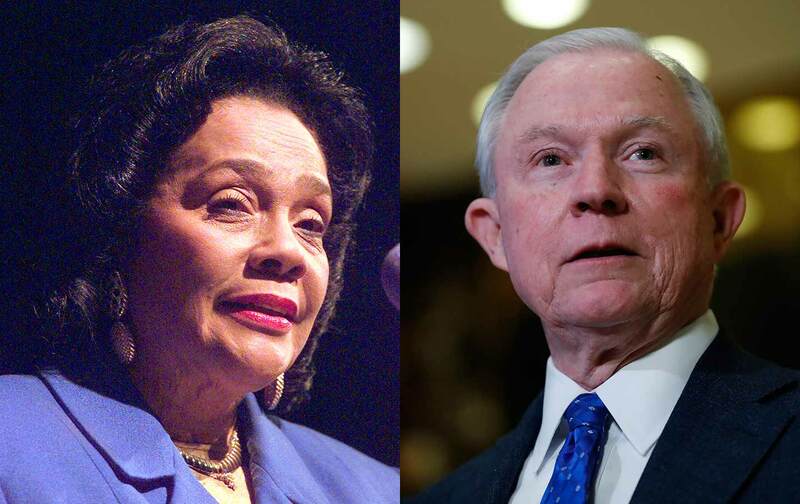 Mrs. King knew that her husband had died for standing up to men like Jeff Sessions. She wasn’t attacking his character or pretending to know what was in his heart. She had witnessed the heart of his policy. Senator Sessions, and anyone else who has a history of supporting systemic racism, cannot be protected from the truth of their own record. We need to have a grown-up conversation about race in America and the ways it shows up in the heart of policies. More recently, Sessions opposed restoring and updating section 4 of the Voting Rights Act after the Shelby County v. Holder Supreme Court decision. He sat idly by as the Supreme Court and politicians dismantled and attacked voting rights. As a US Attorney in Alabama, he unjustly prosecuted voting-rights advocates who worked closely with Dr. Martin Luther King Jr. This baseless, politically motivated case ended in unanimous acquittal of these defenders of civil rights. “A person who has exhibited so much hostility to the enforcement of those laws, and thus, to the exercise of those rights by Black people should not be elevated to the federal bench,” King wrote. His support to repeal health-care access, which impacts 3 million African Americans, is systemic racism. His refusal to support living wages for the 54 percent of African Americans who make less than a living wage is systemic racism. Scapegoating Muslim refugees and mobilizing a deportation force is systemic racism. Senator Sessions has a clear record of promoting xenophobia and religious bigotry; his former aide Stephen Miller, who learned political extremism in my home state of North Carolina, is reported to be the chief author of Trump’s Muslim ban. Sessions has defended the legitimacy of religious tests in immigration policy that could be used to ban immigration by Muslims. None of this is an attack on Senator Sessions’s character. Senator Warren knows as well as Mrs. King did that Jeff Sessions can smile and be cordial. But his whole political career has been about defending systemic racism. This fact cannot be silenced in our public discourse. Racial inequality persists in America not because of men in white robes but because of the policies supported by men like Jeff Sessions. Gutting public education in the name of “choice” is systemic racism and has been since Brown v. Board of Education. Using dog whistles to attack so-called “entitlement” programs, which actually serve more white people than black or brown people, is systemic racism. Promoting “law and order” policies that target poor black and brown people for mass incarceration is systemic racism. Talking about voter fraud and crime-ridden communities while plotting voter suppression is systemic racism. If Senate rules allow this truth to be shut down, then the Senate rules are wrong. While many extremist leaders continue to try to hide the truth of their embrace of systemic racism, we as moral activists will not be silenced. We are called to do justice, love mercy, and walk humbly with our God. We will show up. We will sit in. We will cry out. We will not stand down. Those politicians who believe in a moral agenda for this nation must do the same.